Habit: Plant with flowers generally either all bisexual or all pistillate. Stem: generally 1(many), 5--30 cm, 3--7 cm diam, spheric to long-cylindric, firm; tubercle axils bristly. Spines: central spines 1--4 per areole, 8--15 mm, 1 hooked; radial spines 11--22, 4--10 mm. Flower: 10--22 mm, 20--40 mm diam; outer perianth parts entire to minutely fringed; inner perianth parts 8--12. 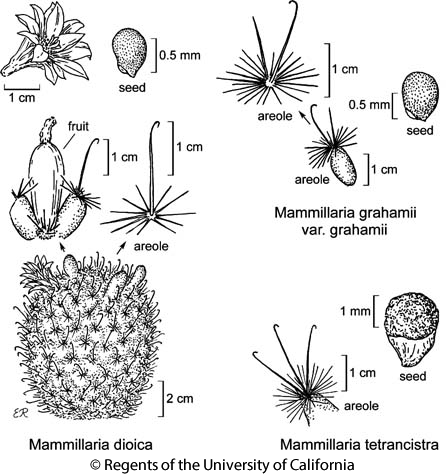 Fruit: 10--25 mm, in age ovoid to club-shaped. Seed: aril 0. Chromosomes: 2n=66. Citation for this treatment: Bruce D. Parfitt 2012, Mammillaria dioica, in Jepson Flora Project (eds.) Jepson eFlora, http://ucjeps.berkeley.edu/eflora/eflora_display.php?tid=32686, accessed on April 22, 2019. SCo, w edge DSon; Markers link to CCH specimen records. Yellow markers indicate records that may provide evidence for eFlora range revision or may have georeferencing or identification issues. Purple markers indicate specimens collected from a garden, greenhouse, or other non-wild location.